On a wintry February night, the two of us sat next to each other on the kitchen bench, there at the table. He slid my birthday present in front of me. Outside, the wind howled, whipping snow into snarling swirls. I bit my lower lip, then peeled back the newspaper that he had used to wrap my birthday present. He sat with his chin resting on his fist, watching me, like he knew for sure he’d picked the best present a woman could ever want. I say this: every kiss begins with a cup. Because I pulled a pottery chalice from the cardboard box, ran my finger around its rim. My chin quivered. And then I kissed my handsome groom. Again and again, we’ve dipped into that cup on this farm; we’ve filled and re-filled the cup with ruby promise. Friends have gathered here, on this same kitchen bench, and we’ve passed the cup around the table of grace. We’ve whispered thanks for amazing grace. We’ve cried such good tears, right over top this one solid cup. Last Friday, I carried that same cup to a table in Nebraska for a retreat; I packed the cup in my luggage, wrapping it in layer upon layer of clothing. You don’t want to break your most precious gifts. I have only begun to learn what the cup really cost. And how the cross changes everything– right here in my home, for sure. But also in a world racked with pain, swirling with howling storms in Boston and Philadelphia and Texas and all over the planet, really. The world rages on, even when we beg the CNN ticker to stop. But the cup stands firm on the altar. Firm. The cup? It’s the most valuable thing I know – not because of what’s on the outside, but what goes on the inside. I couldn’t live without it, I tell you. On Sunday morning, at a retreat in Nebraska, I watched as sisters and brothers shuffled forward, in one long line toward that pottery cup. They took bread, and dipped it into that cup, that simple pottery cup, dipping into the truth of radical and appalling and very personal grace. That God would stoop so low, all the way to Earth, to save us. That our holy Father, on the throne, would send His Son to Earth to rescue the fallen ones, the ones who are the spike in His sinew, the thorn in His brow, the spear in His side. He came for us. The whole messed-up, sin-soaked, broken, crooked lot of us — tired and scared and joyless and nervous and goofed-up and half-cocked in our thinking. What in the world was Jesus thinking? He didn’t have to, you know. He could have whisked Himself away from Gethsemane. He said it right there in the Garden: “Take this cup from me.” But then He added this: “Yet, not my will, but thine be done.” He took the cup anyway. He still holds out a cup. Wants us to unwrap it, right in the middle of whatever storm is swirling outside the windows of our very own souls. Slides the gift across the table. Asks for a sort of kiss in return. A kiss from His bride. This cup? It is appalling, radical grace from a God who actually loves sinners, who actually loves us. I take home a drained cup. And have never felt more full. Enter your email to get inspiration delivered straight to your inbox. You will also get immediate access to exclusive FREE resources on my website. Yes, He didn’t have to. And neither do we have to [live His will]. But that’s what love does. It does it anyway. THANK GOD! This is beautiful. Especially love this: “He still holds out a cup. Wants us to unwrap it, right in the middle of whatever storm is swirling outside the windows of our very own souls. Slides the gift across the table. Asks for a sort of kiss in return. A kiss from His bride.” He is so good. Jennifer, thank you for your message this morning. I’ve enjoyed reading through you and others the impact the retreat had on many. Wish I could have been there. My faith is still so new to me and truly have “only begun to learn what the cup really cost. And how the cross changes everything.” This is one of the reasons I love stopping by others pages and reading what God has placed on their heart. I learn and grow from the hearts of so many. Jennifer, this is beautiful! It’s as beautiful as what Dietrich Bonhoeffer wrote about communion. He wrote about communion being like receiving a package from home. You know the people at home love you but when you get a package from them, it just reaffirms their love. Communion reaffirms His love. I was thinking about how you had that cup, perhaps two of them, in your hands as we walked outside to take photos that day. How I’ve done the same thing when my husband and I travel and set up communion, we have one of those pottery chalice’s too. And I’m thankful that we drink from the same cup you and I, whether in Nebraska, Iowa or South Carolina. The communion of friendship is a holy place. I’m thankful for you. Love drinking out of this cup! Thanks for sharing this beautiful story, Jennifer. I saw it, Jennifer, in Laura’s beautiful photos. 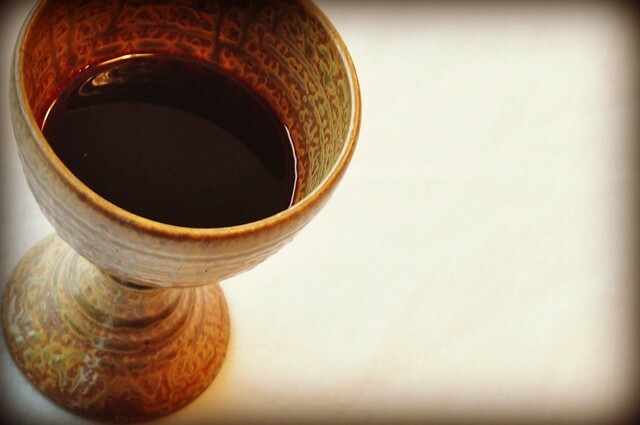 It didn’t escape my notice – why there was a pottery chalice, a wine, and bread, and I thought you had holy supper remembering what the Lord had given so we could have LIFE. Every month, when we do it in Church, too, it doesn’t fail to recapture my heart and refresh my love. I often think about how He prayed in the garden for God to take the cup… but He moved forward with purpose for me anyway. Such love! Yes, dear one, that glorious cup He offers us speaks of so much love. in the Hebrew traditions of ancient times, a suitor and his father would visit the girl’s house he wanted to marry. They would sit around a table with the girl and her father and make their request for her hand. The prospective groom would take a cup filled with wine and take a sip. Then he would offer the cup to the girl. If she accepted his hand in marriage, she would take the cup and have a sip. That cup is called the Ketubah cup; the cup of betrothal. Every time we take that cup and drink, we accept our Heavenly Bridegroom’s hand in marriage. The second post I wrote on my blog last year was about the Ketubah. Thanks again for being our gracious hostess. “The world rages on, even when we beg the CNN ticker to stop. Thank you for this beautiful reminder of His great sacrifice for us. Thank you for being His vessel – how His Words through you always bless me. Welll….my reply box went “wiggy” on me and it should have read “that Beauty-full cup” but it didn’t and so now it might. Blessings Jennifer! There are a number of writers I hope to meet someday and you are on that list. I love knowing the story of the cup and the Cup–the bestowing from groom to bride, from Groom to Bride, the way it traveled from Iowa to Nebraska, from Heaven to earth, the way shattered souls (including mine) dipped into its grape-red contents, the way His shattered body spilled His grape-red blood, the way we drained it dry, the way God drained Him dry. For the amazing truth is that though Jesus asked for the cup to pass and then surrendered to God’s will, Scripture said that God was pleased to crush Him. Wine comes from crushing. Forgiveness only can. Without His death, we would have no life. Oh….Jennifer, this is such a sacred post=-so utterly moving and meaningful. I am humbled to read and re-live it. I totally get your point about not wanting to break your most precious gift. But in another way, your most precious gift was broken–just for you (and for us all). This is so precious and a reminder that the best gifts are ones we cherish. Thank you for hosting! Oh my. I love this. And you. And that goblet. Thank you for it and its partner – such a rich time, made possible by your generous heart. Thank you. ‘This do, in remembrance of Me’ It is all amazing grace!! !